US$25 or the Euro equivalent plus postage. Order by credit card, using our secure server bank owned system. Heretofore very little has been published on accordion repairs and maintenance. This volume was the first thoroughgoing full scale accordion service repair manual in English language to appear in print. Contents Page. It describes in detail the construction and function of the various parts and how to test for and remedy practically every type of disorder that is likely to occur in accordions. A section on alteration and reconstruction with power tools and shop equipment and instruction for making special tools and equipment to facilitate repairs is included. In the tuning section there are diagrams showing the arrangement of notes on the keyboards of the almost every type of accordion. 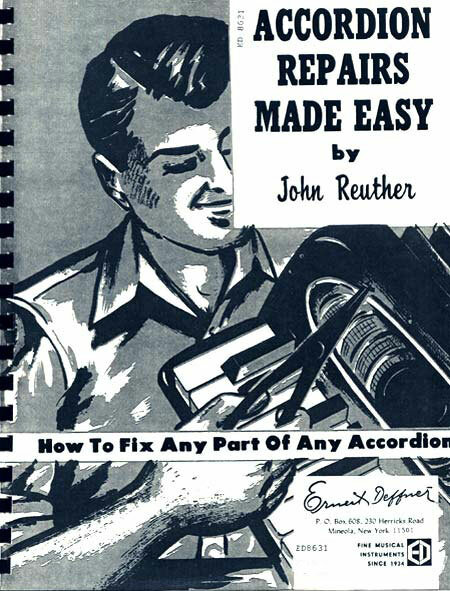 The entire manual is well illustrated with photographs, diagram and charts, making it very easy for any person to learn to repair and service accordions. The Accordion Repairs' book is an original and comprehensive reference guide which explains and describes in detail the construction and function of the various parts plus how to test for and remedy practically every type of disorder that is likely to occur in accordions. For many years we have felt the need of an Accordion Repair Manual, but the great difficulty was in securing the services of a person with ability in both doing repair work and writing about it. In John Reuther, we found a most qualified person because of his considerable background in both of these widely different fields. The author has spent over twenty-five years in various phases of the industry, not only in design and manufacture of accordions, but in actively teaching and promoting his own patented innovations. As a matter of fact, it was John Reuthers daily detailed records kept during his years as foreman in one of the leading accordion factories, that furnished some of the necessary material and data for this book. John. Reuther has also been active in writing articles on accordion techniques and related subjects for the music journals. While not replacing recognised repairers, The "Accordion Repairs Made Easy" book is an original and comprehensive reference guide which explains the workings of inside the accordion and offers a breakdown of the possible problems, how to diagnose them and their solutions. The book is therefore pertinent at all levels of expertise: from musicians who want to understand how their instrument works through to teachers and apprentice repairers who can use the book as a unique tool of reference. You can see from the Contents Page all the different topics this book covers. We sincerely trust that this work will be the answer to the many service and repair problems now besetting teachers, dealers and accordionists. O. Pagani & Bro. Inc.
credit card, using our secure server bank owned system.